Commercial sound systems work differently than the stereo equipment you use at home. One amp powers many speakers, not just two. A high-voltage commercial system are the most economical, practical, and safest solution for any business. What determines the type of sound system you will need? The size of the room–and more specifically, the height of the ceiling. Ceiling height is an advantage. The higher the ceiling the more sound you can get from a single speaker. Your expectations. What do you want your sound system to do? How many speakers will I need? Again, it will depend on the criteria above. One key indicator however, are the ceiling lights. If you have pinspot lighting in the room you wish to install a sound system in, you can gauge that each pin-spot light will equal one speaker. 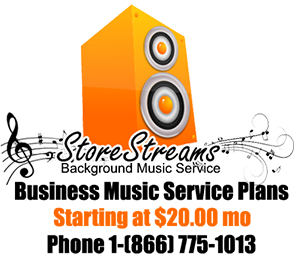 StoreStreams can help you design a sound systems to meet your needs. StoreStreams works with you to determine your requirements and expectations. Then we design the right system for you and your business.